If you have been to the sea or ocean on holiday, then you know how hard it is to resist collecting seashells and other objects scattered around the beach. With all of the different and pretty shells available, it is like finding treasure. Kids especially love to collect these things in their buckets as souvenirs from their trip. When you get home, you do not want to throw away these vacation tokens but sometimes do not know what to do with them. 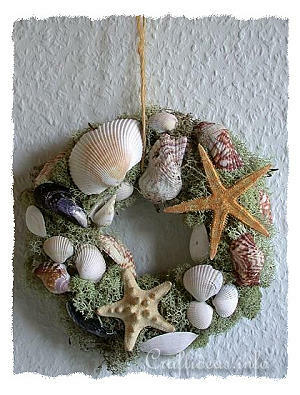 Why not make a wreath such as the above one to decoratively display them. 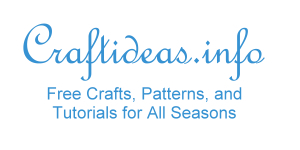 This craft is so easy and is a lovely reminder of the trip long after the vacation is over. 1. Make sure all of your shells are washed and sanitized to remove any odors or dirt. 2. Hot glue the moss pieces carefully on covering the wreath. If there are some weak spots, it is not a problem since you will be gluing the findings onto the wreath afterwards. 3. 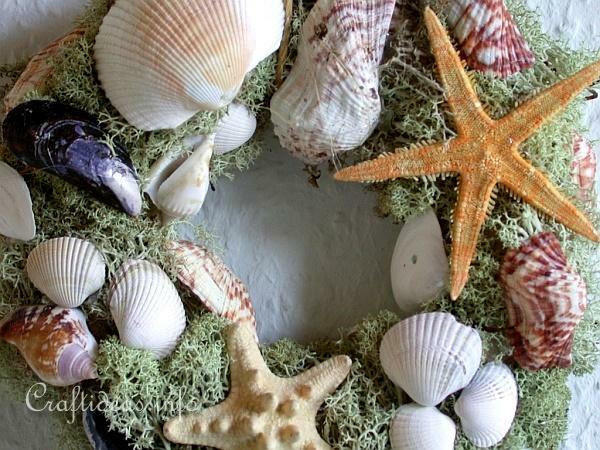 Once the moss is as you like it, arrange the shells and starfish in a decorative way and hot glue them onto the wreath. 4. Once you are satisfied with the wreath, tie a rope around for hanging. This is a close up view of the wreath. 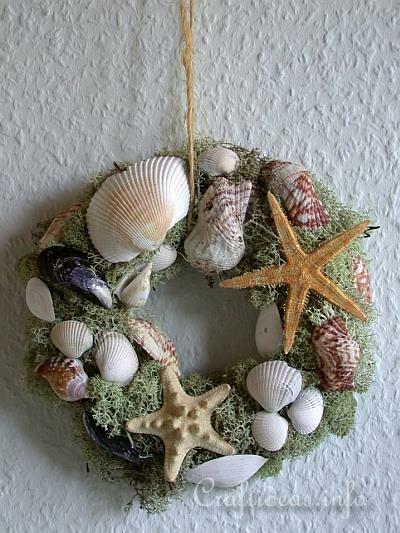 Even if you are not able to take an ocean vacation, you can also purchase shells at a decoration or craft store. Iceland moss adds to the natural look.